I've been working on a project to cut our home energy costs. First I laid out my plan to improve our homes heating energy usage. We started with a home energy audit and then we got air seal and duct seal testing done. Next we got bids on the work and picked a contractor. It took a couple weeks to iron out details with the contractor but they've now finished all the air sealing and insulation the work. 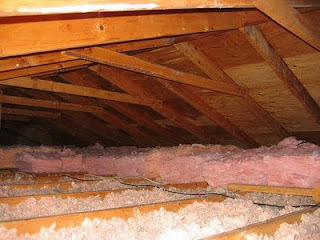 The total up front cost for all of the insulation work is around $6,300. We'll get much of that back via federal tax credits, state tax deductions and rebates from our energy utility. The total of all tax benefits and rebates is around $3,100. So in the end our out of pocket cost should be roughly $3,200. I really don't know how much this will save us on our energy bills. Previously I had estimated something in the 20-40% savings. But those estimates might have been optimistic. Even if I assume just 10% savings then thats $120 a year. Our payback period for the insulation could be as low as 7 years and as high as 27 years. Next we'll probably move ahead with the next stage of the project and get bids on having a heat pump installed. A heat pump should cut our heating costs significantly. I find many sources citing energy savings of 50% range. After the insulation savings, such a 50% cut in costs from installing a heat pump could potentially save us $350 to $550 ballpark. The cost of the heat pump will likely run us $4,000 to $5,000 range. We can get something around $800 to $1,500 in tax incentives and rebates. Less the credits our out of pocket cost would be in the $2,500 to $4,200 range. With energy savings of $350 to $550 and a cost of $2,500 to $4,200 our payback period for a heat pump would be as low as 4.5 years or up to 12 years. Plus we don't have air conditioning now and a heat pump would add that to our home. Given the energy savings I think a heat pump will be a good investment.